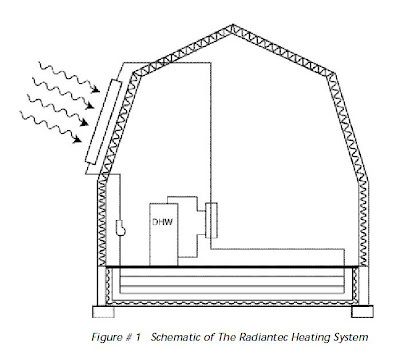 Heat storage for solar home space heating systems is normally done with a large water tank. The water in the tank is heated by the solar collectors, and the heat is then drawn out from the tank when needed to heat the house. 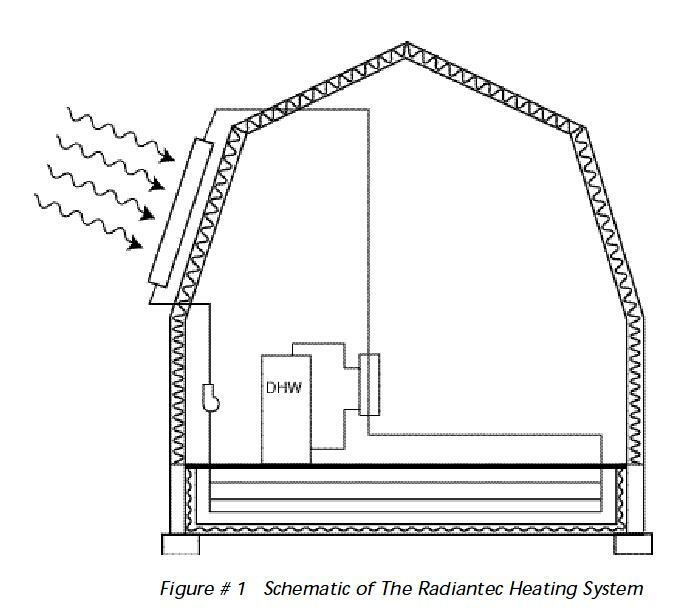 Schematic of a sand bed heat storage system. 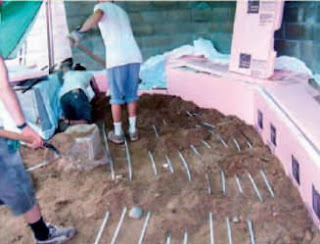 Another alternative that is gaining some followers is to store the heat in a sand bed located directly under the house. Most commonly the sand bed extends under a large part of the house and is typically a couple feet thick. The bottom and edges of the sand bed are insulated from the surrounding dirt using rigid foam board insulation. The house floor slab is often poured directly over the top of the sand. PEX pipes are run through the sand and water heated by solar collectors is circulated through the coils in the sand bed to heat the sand. The potential advantages of this approach are that its very simple in that there is really no heat distribution system required -- the sand bed directly heats the floor slab. It also allows quite a bit of storage at a relatively low price. It allows enough storage that for a very well insulated home, its possible to store up a bit of the winter heat needs in the sand bed in the fall. One unique feature of the sand bed storage scheme is that the living space is directly coupled to the heat storage. This makes the system simple and basically eliminates the need for a heat distribution system, but it also means that there is less control of heat transfer from the heat storage to the living space. The recent article in Solar Today on sand bed storage got me to thinking and running a few numeric checks, and I have to say I'm a bit skeptical of some of the claims made for sand bed storage in the article. I've included these thoughts at the link above, and would appreciate your thoughts on them. If you have experience with a sand bed storage home, I'd love to hear about it. I had a subscription to New Shelter and remember article on sand bed storage. Has it really been 28 years??!!! Your rough calculations on the sand bed concept are very interesting. I would be interested in comments from Bob Ramlow in response to your questions/concerns. Hi Rowland -- You got me interested in New Shelter again -- I just won a bid on ebay for 7 of them. It will be interesting to have a look at what was going on the 70's/80's. Amy -- I've heard from a couple people who had sort of come to the same conclusions on their own, but also heard from a couple people who lived in sand bed homes and liked them a lot. Not sure what to conclude, but there is a lot of interest in sand bed homes, so there is bound to be more info on them as people instrument them and collect more data. Gary goto http://www.daycreek.com/ The guy used a sand bed in his home... I think you actually posted information about his house before on your site. If I remember he said that in practice the sand bed gave him a few days of warmth (if the sun wasn't shining) before he had to use supplemental heat. But it would be better to ask him. You're spot on in criticizing direct-coupled sand beds. The numbers just don't work and never will. http://www.solartoday-digital.org/solartoday/20110102/#pg28 Their model predicted that the house would reach 86F at times if they didn't plant the sand bed out in the yard. Another bad thing about sand is that it is essentially self-insulating. That means you can't transfer the heat into it or out of it as quickly as you would like. Therefore you are driving collector temperatures higher than a water storage system would require, and when you really need the heat, you don't get it quickly enough and auxiliary will come on. I'm not promoting seasonal heat storage of any kind, however. Lots of smart people like Ronal Larson have tried it, and it never seems to work in practice, even with water. Trying to save a Btu in October for use in January just doesn't work. There's already a good way to do seasonal ENERGY storage, though. A grid-tied PV system will convert your surplus energy to dollars in the summer, to be used if needed in the winter. And he should be commended for his efforts to simplify solar space heating. As you say above, the sand bed is a way of combining storage and distribution, and the self-insulating properties of sand help to temper the delivery of heat to the house. A big pit of sand also has a lot fewer construction issues than a big tank of water. However, a since a sand bed with the equivalent heat capacity of a large water tank must be so much larger than the tank, you may not actually save much money with the sand bed as compared to the tank. It's worth noting that Starr never mentions seasonal thermal storage, that seems to come only from Ramlow. And kudos to Gary for being so polite about his skepticism. The thermal mass calculations mean a lot more than dubious comments like "Sand-bed storage offers long-term storage capacity for installations where winters are long and cold." Very interesting! I have talked to a couple of solar installers that have put in sand beds and I haven't once heard that they are intended to store heat for extended periods of time (store in fall for winter) I had only heard or assumed that they will basically store for shorter time frames (day, days, week maybe) depending on the outside temperatures. Bob Ramlow should provide a rebuttal for your calculations Gary. Is there anyway to do that?